We volunteered and held a demonstration at the December 15th FIRST Lego League Colorado State competition. Each of the team members worked and helped run the competition. We worked in positions including referees, practice tables assistants, and quing teams for judging. Before awards, we also demonstrated the previous two years of FTC challenges to the teams. We demonstrated with team #9899, Black Diamond to show the teams what their future in robotics could look like. ​We volunteered at the November 10th FIRST Lego League qualifier in Denver. Each of the team members volunteered in various positions including referees, score runners, and practice field resetters to help with the competition. We also helped teams that were having problems with their robot or wanted game strategy advice. We held a class over the summer to help kids get interested in the FIRST Tech Challenge program. In this class, we used Tetrix and Matrix kits, along with Modern Robotics components. The students worked in teams and shared ideas to build a robot for the custom FIRST Tech Challenge field we designed. We also taught them programming skills using Java in Android Studio. They created unique structures and designs which performed well on the field. All in all, they were really happy and enjoyed the class. Each said they would like to join a FIRST Tech Challenge team in the fall. In this class, we taught students different advanced skills using EV3 programming and building. The kids created many robotic components such as a robotic arm, Spirograph, and a airplane launcher. We also showed them techniques on the FIRST Lego League playing field which would help them for next years challenge if they joined. The kids had a fun time creating the robots and sharing their creations with their parents. Our team taught a beginner FIRST Lego League class to kids interested in learning robotics.We had them build the basic robot and program simple tasks. Then we taught them simple machine mechanisms and had them complete FIRST Lego League missions. They learned about all the sensors and components in the kit. For a fun challenge, we had them make a drag racing robot and race each other. Most importantly, they all had fun and loved to see each others designs. Our team helped kids that were moving on from Jr. FLL to FLL. We helped them by teaching how to build a well structured robot and also how to build effective mechanisms/attachments to complete many missions on the field. We also taught them beginner programming and a few sensors. We also mixed in a little bit of team building and core value exercises to build their teams strength. At this banquet dinner we demonstrated both our Relic Recovery and Velocity Vortex robots to Internet of Things (IOT) team members and executives at Dish. This banquet was hosted to mark their 1 year anniversary since Dish started their IOT team. We were honored to be invited to this demonstration and had an amazing time meeting many new people. At this demonstration, we demonstrated our Relic Recovery robot to the staff and employees of Wells Fargo. We also showed them all of the outreach we do with the local and international communities. In addition, we were able to show how the Wells Fargo's donations support our team and enable us to hold these events. The employees and customers were very impressed with what we had built and how much we have helped/taught the community. At this demonstration, we presented to head level executives and employees at the Dish headquarters. We demonstrated our robot's functionality and explained our design process from the Relic Recovery season. We highlighted the success and challenges that we faced throughout the season and how we overcame these challenges to make our robot better. We also invited the new team members to join us so they could get a feel what we do for the community and our sponsors. 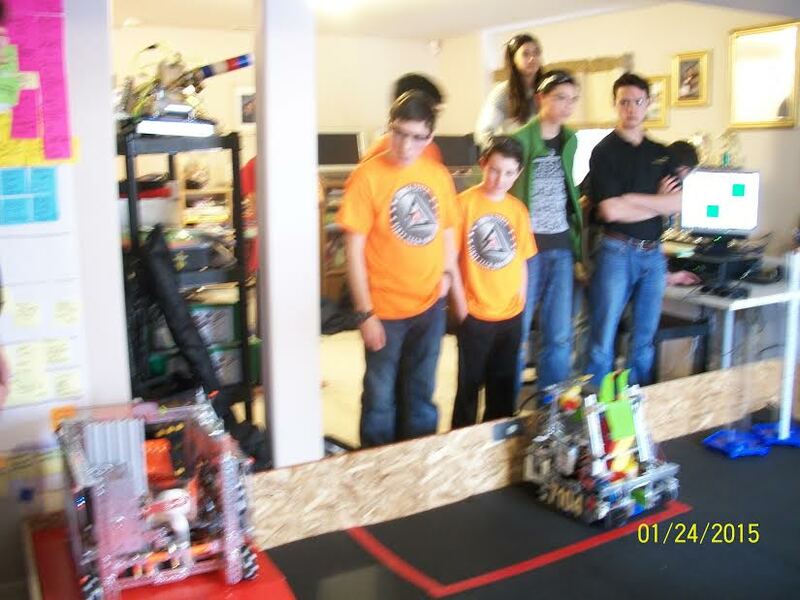 ​At this demonstration, we deomonstrated the Velocity Vortex robot to give the kids an example of FIRST and FTC. We explained what the benefits of FIRST are and what FIRST offers to the community. The kids were really happy and intrigued to see our robot run and asked a lot of questions regarding the robot design, programming, and custom parts. In this demonstration, we demonstrated our Relic Recovery robot at Denver University to many FRC teams and audience members. The teams were very interested to learn about other programs what the FTC program has to offer. We were also very excited to see and learn about the FRC program. We attended an open house at Ingram Machining demonstrating our Relic Recovery robot to their employees and customers. We also saw some unique machines such as a their 5 axis CNC machine. It was an amazing experience for everyone and we were honored to help our sponsor, Ingram Machining. 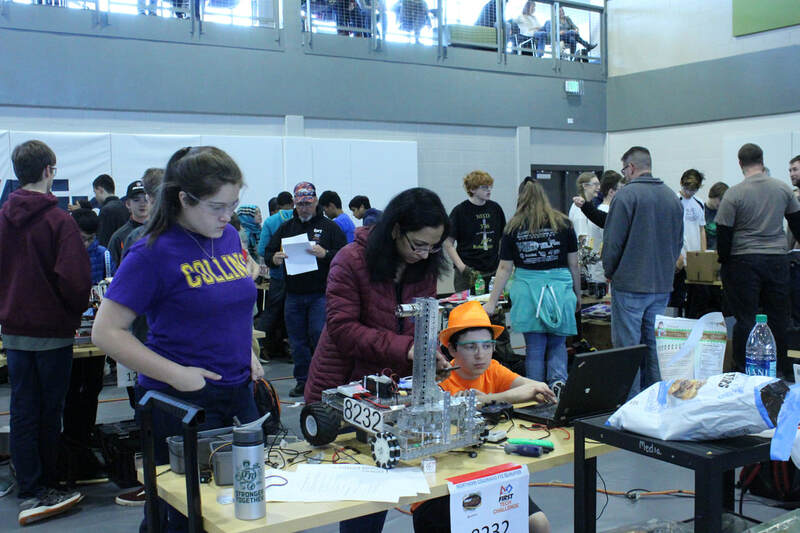 During the Northern Colorado FTC qualifier, we displayed Gracious Professionalism by helping out four FTC teams get their robot up and running so they could have a fun and competitive day. At this demonstration, we brought the Velocity Vortex robot and field. We demonstrated our robot to over 1,000 participants and explained about other FIRST programs in an question/answer forum. We inspired the FLL teams to continue into FIRST Tech Challenge or FRC. We also showed them our videos from last year. We volunteered at the FIRST Lego League State Colorado Championship. Miles, Kaushik, Neeraj, and Spencer were referees while Saketh was a judge queuer. During state competitions we helped teams with their robots and understanding of the robot competition rules. Showing our Gracious Professionalism is always our way of displaying FIRST Core Values. We really enjoyed seeing all the different robot designs. At this demonstration, we showed the Jr. FLL teams our last year's robot from the challenge Velocity Vortex. We let the kids toss the particles into the robot hopper so it can shoot. The kids had so much fun and seeing the balls being shot back at them. Inspiring young kids is so much fun for us and showing our Gracious Professionalism FIRST Core Values. We helped several FLL rookie teams this year by teaching them basic engineering and programming techniques. Core values are always fun for the teams and a great way for them to learn Gracious Professionalism. At this event we demonstrated our robot from the 2016-2017 season. The event inspired a lot of interest in our usage of sensors and autonomous programming. We also explained the FIRST programs to many of the event attendees. Everyone was very excited to see our robot displaying both autonomous and teleop programs. We did a demonstration for Dish to the IT department. They were very impressed with our engineering process, testing, programming, 3D printed parts, and community outreach. We were able to tell them about FIRST programs and many FLL teams will be started in the fall from our demonstration. We are very excited about helping their FLL teams and spreading the word of FIRST. At this event we visited American Academy for a Jr. FLL Expo.We demonstrated the robot and encouraged the kids at the event to continue on their journey with FIRST. The kids had a great time learning about our robot. ​We decided on this event because one of our milestones of the season was to reach to younger students and help them gain interest in STEM and helping a wonderful program that works with underprivileged students. We decided on this event to help our sister team, Data Minions, and demonstrate to the other Jr. FLL participants. During the event we "wowed" the participants with our robot and rapid shooting of particles. This was a very exciting event for us to help and demonstrate our robot to young participants of FIRST. We decided on this event because one of our milestones of the season is to assist any and every FIRST team in the nation. Both Colorado FTC teams really enjoyed getting together to talk about strategy and battery management going to West Super Regionals. We were able to practice and work on autonomous programs as well. We went to the Colorado FTC State Competition to help out teams with software and hardware problems. We decided to do this event in the spirit of gracious professionalism to help teams. At this event we taught the Robotics Merit Badge to Boy Scout Troop #633. We decided to do this event because we get to help our community in achieving knowledge in robotics and interest in FIRST programs. At the Highlands Ranch scrimmage the team helped out other FTC teams with programming and building techniques. We decided to do this event because we enjoy helping other FTC teams and giving them an opportunity to compete at events. The North Dakota partner asked if our team would like to present at the FTC State Competition. He wanted our team to give a community outreach and control award presentation. We were thrilled and honored to be asked to give such a wonderful presentation. 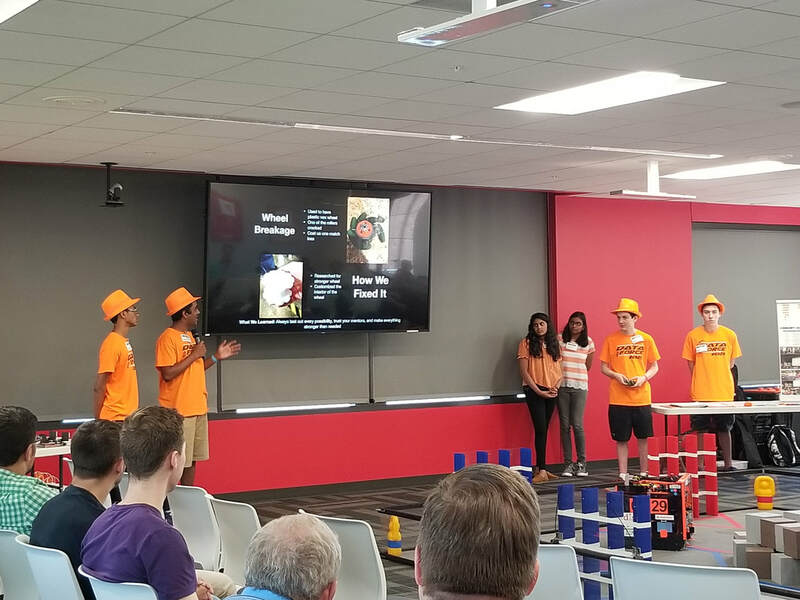 We presented how teams can organize and connect with their community to explain FIRST programs and STEM opportunities to young children of the future. Additionally, we showed a presentation on the control award and what components are necessary to compete at a FTC competition. We decided on this event because it was a great way of helping a Colorado FTC team. We were able to help with question regarding wiring the robot, structures, ideas to try concerning the shooter, sweeper, and area of collection. We also helped with the installation of Android Studio with their programmer. We helped the N.E.R.D.S team who was struggling with sensors when we saw them at the Central Denver FLL Qualifier. They were eager to learn more programming and needed the gyro sensor to help them navigate on the field. We communicated with them via Skype. We decided on this event because it was a great way of helping Colorado FTC teams. We were able to hold workshops to include; Creo, programming, building techniques, and scouting. We prepared flyers, PowerPoint presentations, and Creo drawings for examples to show the FTC teams attending the event. We decided on this event because it was a great way of helping Colorado FLL teams and show our Gracious Professionalism to other teams too. We got into the spirit of competition by wearing hats and enjoyed helping other teams with their robots, programming, and game strategy. We decided on helping this team so they can understand advanced concepts such as gearing and working together with core value activities. They really enjoyed us coming and want us to come back. At this event we showcased with the FIRST teams of Colorado to the gaming community where the professionals attending took great interest in our robot. Along with us we had a two FRC teams demonstrating their amazing robots. At this event we displayed FIRST to the community in Highlands Ranch. We told any people about the many programs of FIRST and grabbed their attention. At our main demonstration, we showed off our main robot to people going into Macy's. We attracted hundreds of customers who were interested about robotics. At the Code Inspire event, the team demonstrated the robot at the event to a group of underprivileged kids. The kids took great interest during the demonstration. We are going to be helping these kids' school districts in adding FIRST programs such as FLL and FTC. After the ISTE event, we met Lily who is a teacher at River Tech Academy in Guangzhou, China. We are going to be creating a curriculum for this school to teach FLL and FTC to over 180 students. We will be flying to China this summer to teach these classes. ﻿The ISTE Conference is an expo in which over 16,000 educators around the world gather to learn about new technologies that can change the classroom experience. ISTE stands for International Society of Technology Education. Their mission statement is "to empower learners to flourish in a connected world by cultivating a passionate professional learning community, linking educators and partners, leveraging knowledge and expertise, advocating for strategic policies, and continually improving learning and teaching". At this event we demonstrated our robotic capabilities along with other FIRST Community teams. Also we discussed the FIRST program and its potential in the classroom with many educators. All teachers were very impressed with the FIRST program and the fun STEM education it offers to students. The FTC beginner class gave us the opportunity to introduce the FTC program to students at the STEM Academy High School in Highlands Ranch, CO. The STEM Academy team received a jump start on the upcoming season as we taught them basic robot construction by having them build a Rangerbot. In addition, we introduced the team to teleop Android Studio programming, design using the CREO design tool from PTC, soldering techniques for using Anderson Powerpoles connectors, and best practices for wire management. The FLL Advanced class for the STEM High School continued instruction from the FLL Beginner class to include understanding gearing, gear ratios, when to gear, and building a robot from their own creative design. The team expanded the students’ knowledge in programming by teaching MyBlocks, data wires, and variables. Lego Digital Designer was used to get the students interested in CAD design. The class was a huge success and all students will be joining a STEM FLL team in the fall at STEM school. The FLL Beginner class for STEM High School taught the students basic concepts of FLL. The students started out by building the basic robot that came with the kit. The next day the team learned basic programming such as going forward, using sensors, and line following. They then deconstruct the basic robot and built their own robot design using the skills that they learned. At the end of the week their goal was to complete missions on the FLL table with a fun competition among all the students. Overall everyone had a great time with students continuing over to the Advanced class. We built three unique EV3 robots. The party attendants drove around the robots using the EV3 Command Center app on their phone. The attendants also learned how gearing and robot structure affected the speed of the robot. The birthday attendees had a great time and even wanted us to stay longer. At these events we helped judge, ref, queue, and level the fields. We realize that volunteering at these events helps amplify the experience of these rookie and veteran teams. In November we held a FTC scrimmage at STEM High and academy. Eight teams attended to test their robots and to scrimmage with each other. All the teams really appreciated the time together to learn and work on their robots. They want more scrimmages and time together in the future. Also, they would like more workshops too! We held a FTC workshop on structure, programming,strategy, and rules of the game. First we showed them how to make sure your center of gravity is properly balanced and the importance of a balanced robot. Then we taught them how to use Math Cad and Creo (3d modeling software). Programming wise we taught them the differences between android studio and app inventor and how to use them both. Lastly we showed them the game and introduced them to strategy. The lucky teams that attended received a certificate for parts from ServoCity. Thank you ServoCity for your helping our Colorado teams!! We demonstrated last years robot at STEMosphere and discussed the first program with the STEM community. STEMosphere is where the STEM educators and attendees learn about STEM programs offered in their area. 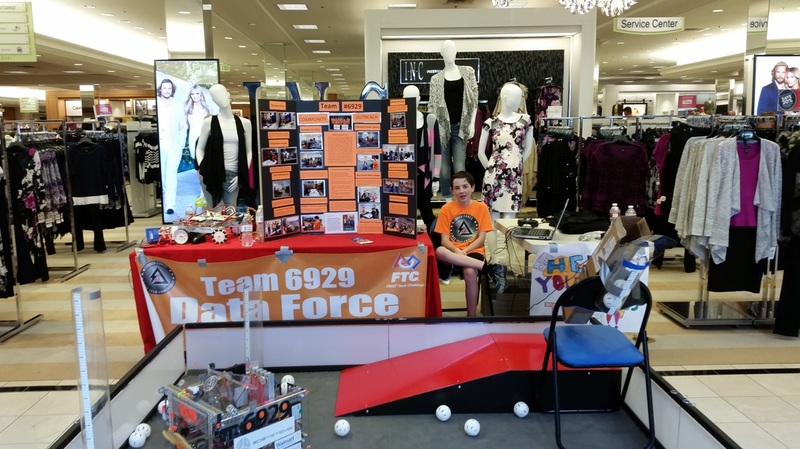 We volunteered at Macy's where we demonstrated and showed last year's robot. At the FTC kickoff where First released this years game and we taught other teams the proper way to install the anderson power pole connectors. A a local Summer Camp called Camp Invention we demonstrated our robot and told them what FIRST is about. We showed over 50 kids what the FIRST community is about by showing them the Cascade Effect FTC challenge. We mentored the FLL team; Elite Enginerds (team 15852) for the past year teaching them the key points in running a FLL team. The Elite Enginerds recently competed in the Denver East Metro Colorado FLL qualifier and won 1st Place for Core Values and will be advancing to Colorado State Championship. We helped with Lego build at the Highlands Ranch Library by demonstrating last years robot and helped kids build Lego robots. Also, we inspired the parents and children to explore the possibilities of the FIRST programs at their schools and community. We helped STEM High Academy FLL team get off the ground by teaching basic robotic designs, programming, and core values of FLL. ​We demonstrated at an event called Adventure Point Grand Opening where 400 scouts were present. We promoted the FTC program and helped understand the program and basic robotics. We also demonstrated FLL and had them build Lego attachments for the robot. During Colorado FTC Championship our team set up a booth to help out other teams with their software and hardware problems. We helped out with queing the teams and even let them borrow one of our laptops needed for field control. We gave our field to the Highlands Ranch Qualifier. 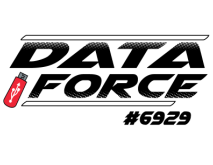 Many teams attended the qualifier and were able to use the official field provided by Data Force during the tournament. During the Colorado FLL State Championship competition, we demostrated the current FTC robot for the Cascade Effect challenged to over 1,000 people. The FLL teams were thrilled to see how the robot worked, asked several questions, and enjoyed seeing how the robot performed. Several teams asked our coach questions about moving up from FLL to FTC. Our team also helped during the tournament with programming and engineering ideas for the FLL teams. We scrimmaged with FTC Team #7104 to help each other with strategies for the upcoming qualifying and state competition. We really enjoyed the time together to work out some issues with our robots. We mentored 3 FLL and 2 FTC teams during this season. We demonstrated at the Highlands Ranch Library for a FLL rookie team. Our team demonstrated what is involved for competing at the FLL level for new rookie team. We prepared a fun CORE VALUE excercise which they LOVED. WE mentored the FTC team from STEM to get them started off. Some more friends from team members also wanted to learn more about FLL robotics. We taught them how to build a Lego Mindstorms Robot, program the robot and sensors, and compete in part of a previous years FLL missions.They were very grateful to take the class and are looking for FLL teams to join. We taught a two week long class at STEM High that went over FLL robotics. Our team taught the STEM students how to build a Lego Mindstorms robot and program the robot. This class will then lead to FLL teams at the STEM school. We taught a week long summer camp in the morning at the STEM high school. This class was a basic overview of FTC. The STEM students built an FTC robot, programmed the robot, and completed a mission challenge with the robots that they had built. The STEM school will start a FTC this fall which Team #6929 will help later in the season. Our team also had some friends that wanted to learn more about FTC so we taught a class what FTC was all about. We taught Ben and Nick how to build and program an FTC robot. We also did a core value activity with them. They learned lots about FTC and were very glad to do the class. We demonstrated our robot in front of the crew of Levin Orthodontics. We explained what our robot could do based on last years competition Block Party. We also explained FIRST and FTC. They were very impressed with our engineering and creativity. After this demonstration at Levin Orthodontics generously sponsored us. THANK YOU LEVIN ORTHODONTICS! We discussed with a rookie FLL team (#1073) what FLL is all about. We showed them a FLL Lego Mindstroms robot, a FLL Science Project, and some FLL core value activities. This benefited their team in succeeding during their first year in FLL. We demonstrated at the STEM High Academy Silent auction. We showed both FLL and FTC programs the school was going to start. We plan on helping the STEM schools FIRST programs. We were able to show our robot at the 2014 Denver Area Scout show in April. At the show we demonstrated our previous seasons FTC robot and a race track including obstacles with Lego Mindstorms robots. The Scouts competed with each other because there was two robots connected to a computer. This gave the scouts a hands on experience with FIRST robotics.